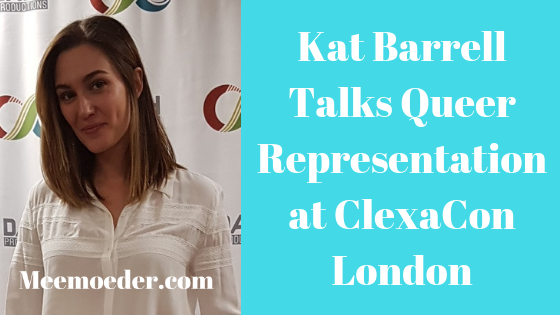 I finally had time to write down the interview with Kat Barrell we had in the press room during ClexaCon London. I had released the video immediately after her press room visit, but I never had the chance to accompany it with a blog post. So, here it is (and the video as well). Below, I have written down what she said about queer representation and mental health. If you want to hear the rest of the interview, please watch the video. Please subscribe to my channel if you haven’t already! Me: What is the first thing that comes to mind when I ask you what content creators can do to improve queer representation in media? Kat Barrell: I think making sure that the content creators are queer. I think, especially with the feminist movement in Hollywood right now, and the queer content, I think you need to have people in the writers’ room, people producing, directing. Those people are making the decisions. It’s not the actors. We are kind of the last ones to come on board. We need that representation right from the get-go, right from the top, and we need people telling their own stories. Kat Barrell, why do you think events like ClexaCon are so important and why is it important for people like yourself to show up and make an effort? Kat Barrell: What I have noticed doing these conventions now over the past couple of years is… You start to notice patterns. The patterns that I think is so great is that the guests start coming for us but for each other. You see these groups of people going to conventions all over the world over and over again because they want to be with their friends and they found this community. And that is what I think is so beautiful about these things. You have this feeling of people who may have felt isolated coming from a small town or don’t feel accepted and then they come to this amazing, beautiful weekend full of acceptance and love and happiness and celebration. I think especially in this community, feeling like you have a place to belong and where you are celebrated and respected is huge. I think it is why it is so important for us to come. Because that is also us saying: “Yes, let’s celebrate this. Let’s be together and share it and be proud of who we are.” It’s beautiful. You have been to many conventions now. Would you say representation in Canada and America is different from representation in Europe? Kat Barrell: I think Europe… It depends on where you are in the country. America is such a huge country that I think there is definitely a difference in different cities. I will say my biggest, I mean the experience I have had so far was when I went to Brazil. There is a very different situation over in Brazil, especially with what has happened recently with their presidency. That is why it is so important that we keep having these conventions, especially for people who can’t be here. Because they can still experience the videos and at least there is a sense of knowing that it is happening and knowing that they can engage with that community online. But I think the biggest difference that I felt was in Brazil. North America and the EU, we are in a very different place with representation and acceptance and respect and all of these things. Whereas I feel that in Brazil, there was a completely different shift of… I mean the bravery that it took for a lot of these people to even come was incredible. And I am talking serious, like…. Not just emotional bravery but some people who are afraid for their safety, which is horrible. It is a good reminder of how far we have to go. Me: Thank you so much for your recent speech about mental health. You started off by saying how nervous you were because you did not know how the response would be. Me: I was wondering how the response has been. Was there anything negative too because you said you were afraid you were not going to get hired? Kat Barrell: Not that I know of. There might be still. It’s still pretty… I was only a few months ago, I think. I do feel we have crossed, hopefully, a threshold with mental health. In the past year or two years, it has been spoken about a lot more in the media. People are coming out with their own struggles more and more, and their triumphs and successes. Just getting people to see someone who you admire… Because we are really good, in the media, at creating this kind of perfect persona, where it is almost as if you work as an actor, your life is any different than anyone else’s, which is completely untrue. Kat Barrell: I feel everyone has been super supportive. I have gotten nothing but great feedback from people of how it has helped them see someone they admire speak about her own struggles, which I did. We have to keep talking about it. I don’t think we should be scared. And, I kind of feel that if someone does not want to work with me because I speak openly about my mental health, then I’m not sure I want to work with them. Me: Well, I wanted to thank you personally. It gave me the courage to talk about a friend who committed suicide in a video, so thanks. It was right after your speech, so thank you. Kat Barrell: Oh wow. Amazing. Well, congrats to you. Thanks so much for reading this interview. I hope you enjoyed it. If you want me to continue going to these conventions, I need to reach more people. That is where you can help me. Would you mind sharing this blog post and this video with your friends? Alternatively, you could pick the video in which I talk about suicide or any other video. Please share it on social media and privately. I need more subscribers and views to keep making these videos for people who cannot go themselves for whatever reason (well, you heard Kat) and for people who want to relive their happy experience. Thanks so much for your support! PS here are my interviews with Natasha, Elise & Annie, Jamie Clayton, the team behind I Can’t Think Straight, Nicole Pacent, Mandahla Rose, and the directors of ClexaCon. PS PS want to own a copy of Wynonna Earp’s seasons? You can order them on Amazon or Bol.com.